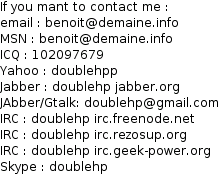 Gentoo Forums :: View topic - How to specify a DNS for a specific domaine ? How to specify a DNS for a specific domaine ? Posted: Fri Mar 28, 2014 10:34 pm Post subject: How to specify a DNS for a specific domaine ? pre question: in resolv.conf, what's the difference between the fields DOMAINE and SEARCH ? What I know is that on the latter, I can put several domains. In resolv.conf, how do i specify a specific DNS IP for a specific domaine name ? A friends of mine told me to look at nsswitch ... but no clue how it works. From man resolv.conf, it can't be done; but maybe I did not read properly ? I mean ... I accept to conf things in /etc, but I refuse to install a resolver service like bind for this purpose. It's so easy to do it at IP level, it's the definition of a routing table; I Can't believe it's so difficult at DNS level, and would require to install bind. I am looking for a similar solution. A friend of mine uses OSX and has this feature (no clue if it ships with the os or not). If you want to install a local DNS Server, check dnsmasq. Much easier to configure than bind. I use dnsmasq for this function - it's pretty easy to do and the documentation is quite good. The "search" line is for when you want to flesh out a short hostname into a fqdn. It will tack each domain onto the shortname and attempt to find that FQDN, until one passes or all such attempts fail.